On February 28, we attended a press conference organized by a group of students from around Southeastern Wisconsin, including Marvell announcing a March 24th march entitled the “March for Our Lives – Milwaukee.” The students announced they would be joining the nationwide day of action in support of legislative action on school gun violence and in response to the horrific events at Marjory Stoneman Douglas in Parkland, Florida. The resurgence of student activism in Parkland, around the nation, and here in Wisconsin is inspiring. Milwaukee educators wanted to support the students’ efforts and organized an art build to prepare posters and banners for the march. Milwaukee artists Paul Kjelland and Nicolas Lampert screen print posters at the art build (Photo credit: Joe Brusky). Students and local artists submitted several stunning images. Nearly every image was used for the final poster and banner designs, with several of the artists also volunteering their Saturday to trace and paint banners, and run and screen print posters. Nearly one hundred people, many students, came through the art build during the nine-hour Saturday time window, including the core group of students organizing the march. Dozens of MTEA members, local artists, and community supporters also joined the collective effort. 1,000 of these “Enough” images were printed. Bay View High School students and their art teacher Bryce Coppersmith submitted this powerful design. Bay View art teacher Bryce Coppersmith poses with the design he and his students collectively created (Photo credit: Joe Brusky). Bryce also spent the day painting posters and banners in support of his students. The poster will be given out on a first come first serve basis before the 3/24 march. Allen Field art teacher Kristin Cheever makes some finishing touches on a poster (Photo credit: Joe Brusky). The prints were lined up along the floor of the Kenilworth Building to dry after being screen printed (Photo credit: Joe Brusky). King Elementary educator Angela Harris and her two daughters Trinity and Zaire (Photo credit: Joe Brusky). Artist Pete Railand submitted this stunning “Protect Students not Guns” image of two students walking to school holding hands casting a shadow encasing the message “Protect Students not Guns.” 1,000 of these posters were also screen printed and will too be given out before the march. This “Protect Students Not Guns” image was created by artist Pete Railand (Photo credit: Joe Brusky). Obama sophomore and March for Our Lives – Milwaukee organizer Marvell Reed holds a completed poster (Photo credit: Joe Brusky). Daisy was one of the youngest helpers at the art build (Photo credit: Joe Brusky). This powerful “Text Message” image was submitted by Milwaukee School of the Arts student Ana Branderhorst. Homestead student and March for Our Lives – Milwaukee organizer Sophia Zhang trace banner before it is painted (Photo credit: Joe Brusky). Milwaukee student Trenice Ferguson submitted this moving image of a peaceful school community nestled on the inside of a hand gun. Milwaukee School of Languages student Joya Headley and Homestead student Sophie Zhange (Photo credit: Joe Brusky). Elisha Branch and her daughter Daisy (Photo credit: Joe Brusky). MTEA retired member Susan Simensky-Bietila and her son painted this image, submitted by Susan’s 7-year old granddaughter, on a banner. Retired member Susan Simensky Bietila and her son paint her granddaughter’s image on a banner (Photo credit: Joe Brusky). UWM art education teacher Kim Cosier submitted this banner design, which was painted on two banners. Several students from Shorewood High School also joined the art build to trace and paint three banners for their sure to be historic 50-mile march from Madison to Rep. Paul Ryan in Janesville, Wisconsin. The students chose Janesville to call attention to politicians like Ryan, who take large sums of money from the National Rifle Association (NRA) and do nothing to address the growing siege of school gun violence. Leaders Igniting Transformation students not only volunteered at the art build, but they also used the opportunity to circulate their petition to bring an end to the MPS School-To-Prison pipeline. It was powerful to watch students, educators, artists, and community supporters working together, forging new networks, relationships, and ideas that can propel and sustain us all for this sure to be long fight. 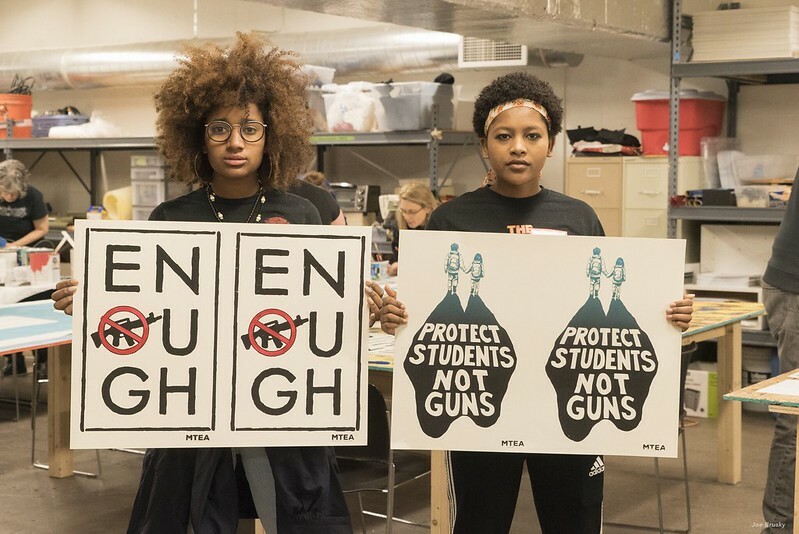 Student organizers for the March for Our Lives Milwaukee (Photo credit: Joe Brusky). The 2,000 posters created will be handed out before the march at the meet-up for the MTEA educator contingent (10th St. side of the Milwaukee County Courthouse) on Saturday on a first-come-first serve basis (One poster per person). It will be powerful to see these images, posters, and banners backing up the great organizing students are doing locally as well as nationally. Together we will win common-sense reforms for our students. We hope you will join us. More photo from the art build here.